Finally gathered time to process all of this madness. I don't think I'm going to do a mosaic so big like this EVER. The amount of work in front of the computer is too much for me. Stunning! Really. 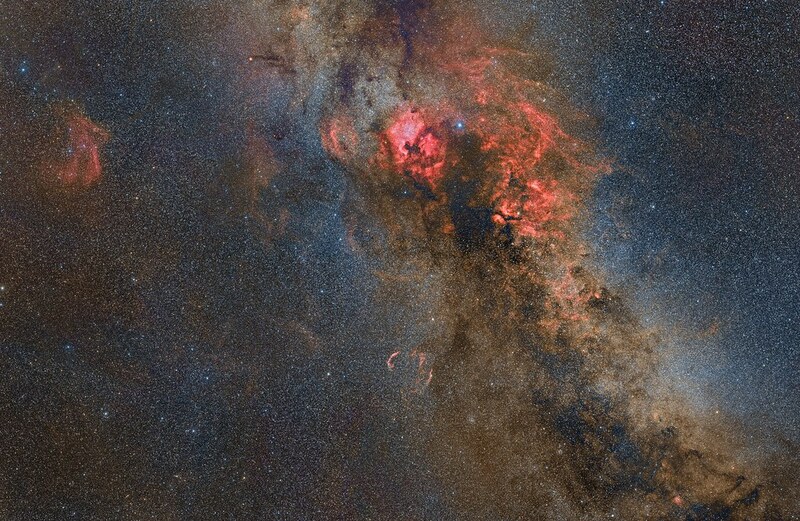 When I look up at Cygnus, I see Deneb. This is amazing! Edited by Dynan, 12 February 2019 - 03:08 AM. I always thought mosaics are too much hard work (I prefer use suitable optics) - but I can appreciate the effort. Edited by michele, 12 February 2019 - 04:06 AM. Just beautiful! You could get lost in that.....I hope youve made a big print for your home! Processing here is minimal, only stacking, calibrating and correcting the mosaic. Something that takes ages of manual work. So nothing done to stars, just as they came out the CCD. Wow! That is brilliant Something I want to strive towards getting done. Wow what a beautiful image. I love it. I'm not an imaging guy, but I do admire astro-photography and this one is simply stunning, the amount of deep sky objects seen on your photo is incredible and I'm having fun looking for them. Absolutely incredible work! I’m super impressed! I don't think I've ever seen a mosaic that looks so 3D. Amazing. We sometimes can become to narrow in our imaging of individual objects in the night sky. Perspective is key, and this one has tons of it. Not only is it well executed, but it shines as a cartographic representation of the region. Looking at a a star chart is one thing, but this is really like a satellite overlay on google maps....The real real....it has that quality that defines inspiration. This is a great result, Manuel. I agree with maadscientist. These widefield images help put in perspective all the images I'm taking through my tiny FOV. The image really deserves all the effort. Wonderful. Worth all the hours you put into it. It would take me 80 years to do that with the way the weather has been lately. GREAT WORK !!!!!! Brilliant! I particularly like the overall color balance.